MOSCOW, March 28. /TASS/. The Russian Chess Federation maintains its strong support of Kirsan Ilyumzhinov in his post of the president of the World Chess Federation (FIDE), Dmitry Peskov, the chairman of the Russian Chess Federation’s Board of Trustees, said. "He [Ilyumzhinov] is very effectively fulfilling his duties as FIDE president in terms of organizing the world championship and the tournaments of other levels as well as popularizing the sport of chess," Peskov, who is also a spokesman for Russian President Vladimir Putin, said. "This is why we express our support for him to remain in the current post (of FIDE president)," Peskov added. On Monday, FIDE’s official website posted a statement on President Kirsan Ilyumzhinov’s supposed resignation. It stated that FIDE’s president announced his decision to step down at a meeting of the organization’s council in Athens on March 26. However, Ilyumzhinov rejected this report while talking to TASS. FIDE Executive Director Nigel Freeman stated on Tuesday that an extraordinary session of the Presidential Board of the World Chess Federation (FIDE) has been scheduled for April 10. Ilyumzhinov maintains that someone tried to play the ‘US-entry-ban’ card to oust him from the presidential post of the world’s chess federation, while FIDE officials cite his earlier made pledges at the Athens conference to leave the post. "During the Presidential Board Meeting in Athens, you several times threatened to resign and at the end of the meeting, three times you repeated ‘I resign’ before leaving the room," Freeman stated. "At the request of board members, an Extraordinary Presidential Board meeting has been called on 10th April to discuss this issue." In November 2015, the United States Department of Treasury slapped sanctions on Ilyumzhinov stating that he had been "materially assisting and acting for, or on behalf of the Government of Syria, Central Bank of Syria." Ilyumzhinov denied the allegations saying he had no commercial interests in Syria. The FIDE chief announced his plans last spring to go to New York for the 2016 FIDE World Chess Championship in November of 2016 and hoped that the US-imposed sanctions would be lifted by that time. However, his hopes were dashed and Ilyumzhinov had to watch the battle for the World Chess Crown online. Russian businessman and longtime FIDE President Ilyumzhinov was re-elected to this post in August 2014 beating former world chess champion, Garry Kasparov. Ilyumzhinov won 110 votes, while Grandmaster Kasparov garnered 61 FIDE mandates. 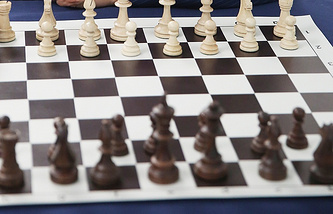 In 2010, Ilyumzhinov faced a similar challenge by another former world champion, Anatoly Karpov, Kasparov's long-time rival. Ilyumzhinov plans to run for re-election again in 2018. The 54-year-old FIDE president, who has headed the federation since 1995, promised to put chess into the Winter Olympics’ program.